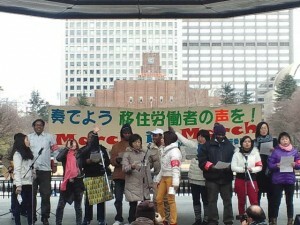 March in March is an action carried out by migrant workers every year in March. 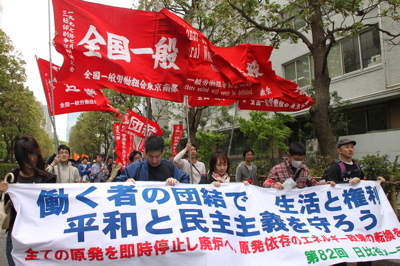 The first time that migrant workers in Japan fought the traditional spring struggle to improve their working conditions and secure their right was in March of 1993. That time was shoutly after the bubble economy ended. Problems of workplace accidents and layoffs were happening one after the other to the so-called “dekasegi” migrant workers who had propped up the bubble economy. 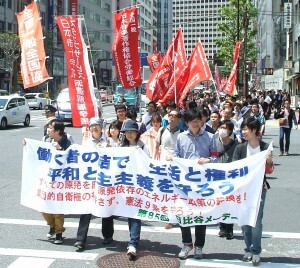 Every year in March since then, migrant workers have taken up the issues which were relevant at the time, and have brought forward an image of the conditions in Japanese society from their point of view. 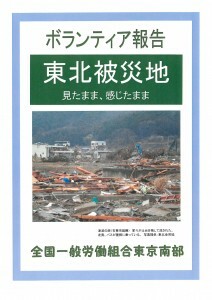 We have continued for volunteers to assist people in Tohoku. 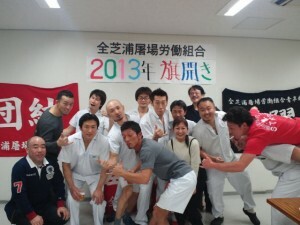 The National Union of General Workers, Tokyo South Chapter (Nambu) has been actively participating in the task of removing debris and mud from stricken areas.Our sister union in Iwate set up to help us make arrangements for volunteers through The Tono Volunteer Center. 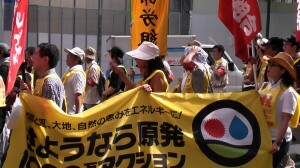 We reported about the volunteer activities on a leaflet.